Does Westborough have bluebirds in the winter? The answer appears to be “yes,” although their numbers are probably smaller than they are in spring and summer. Even during this year’s cold and snowy winter, some Eastern bluebirds (Sialia sialis) have been noted in the area. They may appear in backyards that have feeders or shrubs or trees with fruit and berries. They’ve also been spotted at Mass Fish and Wildlife’s Westboro Wildlife Management Area this January. Other local bluebirds have probably migrated farther south. What do bluebirds eat in winter? In spring, summer, and into the fall, they’re insect-eaters. They especially like relatively large prey that lives in grassy areas, such as grasshoppers and crickets, as well as caterpillars of moths and butterflies. But in winter, they switch to wild fruits. They’re not big seed-eaters, which may explain why people can find it hard to attract them to birdfeeders. Why don’t bluebirds switch to seeds in a big way in winter? The answer probably has something to do with the bluebird’s digestive tract. 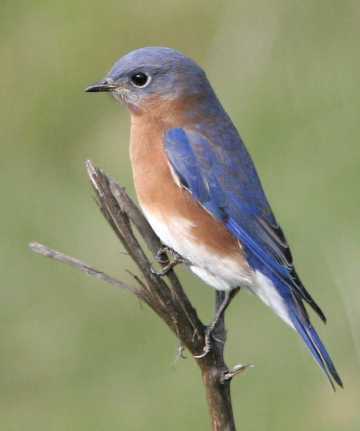 Birds that eat insects and fruits – like bluebirds – have shorter digestive tracts than birds that eat seeds, which apparently need longer and somewhat different digestion. Another suggestion is to try offering winter bluebirds fruit such as raisins (or raisins cut in half) or small zante currents. Some people suggest soaking the raisins or currents before putting them out. Another alternative is to grow fruit-bearing shrubs in or near the yard. Plants that can provide fall or winter fruit for bluebirds include smooth sumac (Rhus glabra), staghorn sumac (Rhus typhina), American Holly (Ilex opaca), red cedar (Juniperus virginiana), dogwoods such as red-osier dogwood (Cornus stolonifera), and many others. Which are the bluebirds that remain in Westborough for the winter? Usually you’ll see a small flock of perhaps 5 to 10 bluebirds. Typically it’s a family group, consisting of a pair and their young from their last nesting of the breeding season. Or the flock might include a couple of family groups. What kinds of places are promising for looking for bluebirds in winter? Generally you’ll find bluebirds in the same areas that they favored during the nesting season. This means grassy or open areas with scattered shrubs, fence posts, or small trees with low branches that make good perches. Watch for them in farmlands, pastures, fields, golf courses, cemeteries, large lawns, and powerline cuts. In winter bluebirds also find shelter in thickets and among low-growing spruce or pine branches. Cold is a danger for bluebirds that winter in our area. So how do bluebirds keep warm at night or on very cold days? They’ve been known to huddle together inside natural cavities – such as holes in trees – or in bluebird nest boxes that people have set up during the nesting season. Depending on the space available, 2 to 20 bluebirds may crowd together for warmth in a cavity. They may sometimes arrange themselves in an orderly way, with their heads together and pointed inward and down, to form a cone-shaped group. This arrangement may help them to conserve heat and prevent them from suffocating. People who want to help out can try providing a shelter for bluebirds to huddle in, according to Westborough’s long-time and steadfast bluebird enthusiast, Marty Newark. He suggests a wooden box about the size of an old milk crate, with a small hole 1-1/2 inches wide. In any case, we can soon look forward to the return of bluebirds that have left the area for the winter. Depending on the weather, they may return from late February to mid-March. Males typically return before the females. The male starts claiming territory – by singing – and searching for nest holes for the female to check out when she arrives. Whether they remain in our area for the winter or migrate south, a pair of bluebirds that nested successfully last year will usually return to the same nest area in the spring to set up housekeeping there again. Last year’s young may also come back to breed in the general area where they grew up. Bluebirds that breed in Westborough may raise two or perhaps even three broods during the nesting season, between April and early August. The young from the first nesting sometimes remain nearby and help the parents feed and tend the next brood. General nest box specifications are available on the North American Bluebird Society web site at: http://www.nabluebirdsociety.org/nestboxspecs.htm. Several different specific nest box plans can also be found there at: http://www.nabluebirdsociety.org/nestboxplans.htm. Westborough residents – individuals or groups – who are interested in building or helping to maintain bluebird boxes can contact Marty Newark at 508-366-7043.